Following on from my last article about guitar pick collecting, I came across this website dedicated to this great little facet of our hobby. Guitar-picks.com is the run by Alan Ralph, who seems to be the world expert in all things pick related. Alan amassed his collection in 20 years. Another remarkable thing about Alan’s collection is that it was not grown via eBay purchases nor through buying collections from other collectors. Neither does he buy bags and bags of picks from those on the inside. Alan has done it the good old fashioned way … by being at the shows and through trading his duplicates with other collectors. 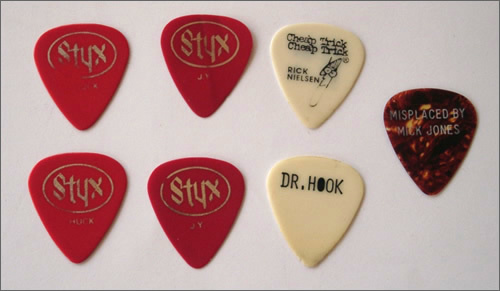 In the early 80’s I grabbed a few picks myself as I used to work at London’s biggest concert venue. Most were unbranded, although I can just about remember where most came from; George Benson, Angus Young, Tom Petty but I thought I’d photograph my meagre spoils from that period. These were acquired from gigs and several of them were well used by the artist before being discarded; The JY Â Styx ones are very thin, and seem to have taken a fair bit of abuse from his playing style! The Rick Nielsen one is from 1979 I think, the others from probably 81-84. I think I’ll start scouting Ebay for a few more! Alan & his website rock!! Alan and many other knowledgeable collectors have contributed photos, information and stories to various PCQ articles & postings.